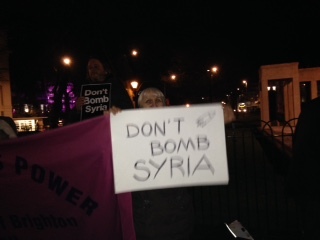 There was an excellent turnout at very short notice for a Don’t Bomb Syria protest at the war memorial in the Old Steine yesterday evening (Tues). 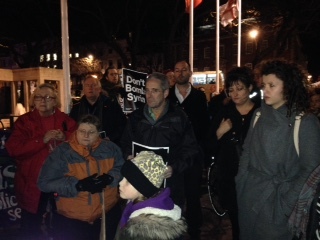 About 200 protesters then marched to Hove Labour MP Peter Kyle’s constituency office in Hove. Mr Kyle has declared he will be voting in favour of the bombing in today’s parliamentary vote in spite of the wishes of many of his constituents.